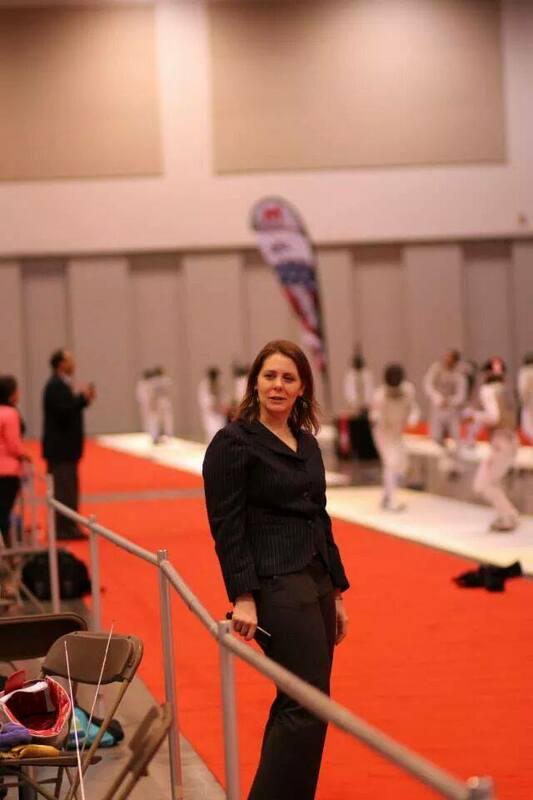 Kate Thomas is the head coach of the Delaware Valley Fencers Club. She is a longtime (excellent, I might add) referee. It’s almost as easy to find refs kvetching about reffing as it is to find fencers kvetching about refs. If you hang out with a lot of refs it’s probably even easier. And it’s easy to quit reffing. It’s easy to see it as a thankless job – standing on concrete for 20 hours straight being yelled at in different languages, blah blah blah. We all know the litany. We all know the litany in part because it’s so easy to find people willing to expound on it at length. But it’s not a productive narrative. I definitely know that song. I’m in the middle of my third reffing career and the only thing that I think is unusual about my path is that I keep coming back to it. My first try was from 2003 to 2007. I worked local stuff all the time, regional and national stuff every once in a while. I probably wasn’t very good but I definitely worked at it. I stopped because I got fed up with being yelled at by coaches. I probably deserved it and, honestly, it was my only real education and feedback, but it was pretty miserable. The second was from 2010 to 2012. I got back into it for purely mercenary reasons: I’m a foil coach and was living in Texas, not quite ready to move back east and set up a club – reffing was the best way for me to get to see bouts, network with people, exist in the larger fencing world. I was a heck of a lot better – confident, learning constantly, etc. I stopped because even as I got better, my assignments got worse. My last tournament, when I quit in a cloud of fury, I was assigned in epee for most of the event, despite having, by then, solid experience in foil. I had a new club and had taken time off from it to come continue developing my understanding of foil, but I was stuck on the other side of the room watching feet. It wasn’t mutually beneficial. I quit. Loudly. But then I reffed nationals in 2013 to help underwrite my fencers’ fees and, absurdly, that lark was the start of my third career, one in which it appears I now work international events and am accepted as a skilled referee. I’ve spent a huge amount of the past year struggling with how this fits into my current life, struggling with the negativity and insecurity that currently seems inherent to much of referee life, etc. Nevertheless, I’m very happy with refereeing and want to continue as much as I can. I don’t say this to talk about myself, but instead to say that yes, I intimately understand the stresses of referees at many levels. There are very real concerns. There is still very little by way of real education. There is little guidance, so refs interpret every assignment, every promotion, every little thing as a performance review. And for every coach who will have reasoned discussions after the bout about the call you blew there are three more trying to encourage you to make a bad call (in their fencer’s favor, of course) during the bout. The hours are long, the opportunity cost is high, the floors are hard, the pay is negligible, the calls are tight, the fencers and coaches are crazy (or did you really miss that call?). Etc. reasons to ref. We don’t overtly talk about these joys nearly as often as we overtly complain, but every time we talk shop, every time we share video to ask someone else’s opinion on a call, every time we talk about how excited we are at how this or that young fencer has grown, we are talking about why we love reffing. There are also plenty of reasons to quit reffing. For all that we talk about our reffing “careers,” it’s most emphatically not a career. It’s a luxury. If you’re smart, it ranks well below things like work, school, family, relationships, friendships, your own training, etc. The pressure isn’t for everyone. The lack of clear feedback and criteria for promotion, the negative culture within the cadre can be infuriating. Whether or not to keep reffing? This is a choice that we all make again and again. And sometimes we stay and sometimes we go. But this sport is a damn cool thing. And it really needs refs. So if you’re upset with reffing, try to find people who can help you. Friends, mentors, etc. Look for the reasons why you’re doing it. See if they’re worth it. And if you think that you have concerns that you can speak to, speak up! USA Fencing is finally starting to take both the cadre and its problems seriously (as well they should – they could have a pretty drastic impact on their main source of income!). Their first referee taskforce earlier this year identified how little this problem has been studied and tried to pinpoint ways to do so; the current one (disclosure: I’m on this taskforce but I’m writing here on my own behalf) is trying to figure out how to most effectively address the main issues – education, recruitment, clear feedback and promotion, etc. I am very hopeful that we can start to change things for the better. And if you decide you need to stop, then stop. The sport, the people in the sport will very genuinely miss you. But, please, don’t try to see if you can make everybody else upset too, don’t try to get other people to stop reffing, don’t try to foment a rebellion or a strike, don’t try to tear things down behind you. And if you’re really leaving because you want to spend time with your family or focus on your real career, that’s wonderful! But don’t say that it’s because you have to, say, pay $35 for a background check or because you didn’t get the rating you wanted. This sport is filled with athletes who train their hearts out and often have a limited window in which to achieve their goals, parents who work long hours to support that training, coaches whose livelihood depends on training these fencers. And it’s also filled with your friends and colleagues and with new refs waiting in the wings who will step in and take on a bit more of the workload if you step out. Don’t make it harder on them by giving the pot one last vindictive stir on your way out the door. Choose the things you love to do and do them with love; find the people you love and ways to spend time with them. If that’s not in fencing, a very heartfelt thanks for your work and best wishes for greener pastures! But hopefully the joys outweigh the burdens and we’ll see you in some venue or another (or at dinner afterwards!) and swap a few stories about the silly or awesome things that just happened on-strip. Staying on as a ref and keeping quiet about the issues because the sport is cool and needs refs is ridiculous. That’s like saying Tina should stay with Ike because while he’s abusive, he’s really a cool guy and he needs her. Fencing doesn’t need refs if they are only going to abuse them. It may take more refs retiring early on for the USFA and the FOC to get the message that people don’t want to take time off from their work just to be abused and used as a commodity with very little guidance, clear feedback, and compensation. The only good reason I can see to continue reffing is if you need to continue to be up to date on how the rules are applied for your own club or yourself. Because reading the rules doesn’t even come close to helping you teach how they are (or aren’t) applied. I hate the: “rules were written by fencers for fencers, so only fencers will understand them” mentality. I’ve heard that too many times, and to me it means we don’t write our rules clearly enough for the lay person to understand them. Wonder why we don’t grow faster as the coolest sport around? That’s one big reason. This article is a call for the status quo. It’s a call for just waiting for things to change for the better with very little in the way of ideas on how to make things better. It’s a call to not make things worse by encouraging people to leave an abusive relationship. This is the wrong way in my opinion to discuss the problems facing fencing officials in the USA. The right way has already in my opinion has already been tried, with referees giving ideas on how things could be made better and being ignored. Why would we want to continue down that path? Remember, I am actively involved in trying to find solutions. This isn’t a call for the status quo, but instead to stop making one another angrier before change can happen. I hear a lot of rumblings about “strike! strike!” That’s going to cause more problems for everyone and isn’t going to fix the ones we already have. Very well put, Kate. I have seen referee development and issues for many years from both sides. The sport is quickly outgrowing its amateur roots. I think the ‘professionalism’ required will soon make its way into reffing as it has started to do in other areas of fencing. Fencing is undergoing growing pains now and refs take a large part of those ramifications on the front line of the sport.